The Alfa Romeo badge logo is representative of the brand’s Italian heritage and the sophisticated, luxury vehicles produced each year. The emblem has undergone changes since its inception in 1910, but still maintains essential elements from the original design — a testament to how Alfa Romeo has stayed true to its roots. 1910: The story of Alfa Romeo’s emblem begins in the early 20th Century, when the automaker was originally named Alfa Milano. Italian aristocrat Ugo Stella acquired the shares of Società Italiana Automobili Darracq, the Italian plant of a French car maker located in the outskirts of Milan, Italy. On June 24, 1910, Stella relaunched the plant and renamed it A.L.F.A. (Anonima Lombarda Fabbrica Automobili). 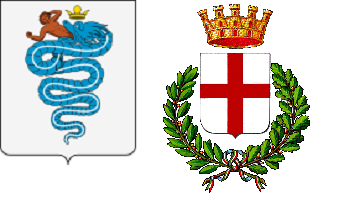 The two symbols were combined on the badge with the words “ALFA MILANO” surrounding them and separated by Savoy-dynasty knots. The Savoy knot is primarily used in Italian heraldry, alluding that Ugo Stella would soon craft cars that were the epitome of Italian luxury. It is evident that Italian heritage and culture were immensely important to Ugo Stella and the original founders of Alfa Romeo. 1920: World War I changed everything for Alfa Romeo. During this time, automobile manufacturing had become too expensive, but Nicola Romeo, an electrical engineer, saw other potential and purchased the company. With Romeo’s expertise, they began manufacturing airplane engines and portable compressors. At the end of World War I, Alfa Romeo returned to automobile manufacturing, designing new models exclusively built to race. 1925: Alfa Romeo entered the racing world with a bang when driver Ugo Sivocci won the legendary Targa Florio race. That same year, Alfa Romeo won its first World Championship. Four Alfa Romeo drivers crossed the finish line with the fifth-place car a staggering behind 45 minutes later. This amazing and unprecedented victory catapulted Alfa Romeo to the top of the racing world. During this period, Alfa Romeo added a golden laurel wreath to its logo to represent its racing success and first World Championship. 1946: As World War II was ending, Alfa Romeo found itself without a leader or factories. Ugo Gobbato, who took over in 1933, was shot and killed in 1945. The manufacturer also found themselves in need of a new badge. The war destroyed many of Alfa Romeo’s factories, including the machines that were responsible for producing the Alfa Romeo badge. This led to the creation of the Spartan, the all-red version of the badge. 1950: With the proclamation of the Italian republic, the Savoy-dynasty knots were replaced by two wavy lines and the badge was once again created in the original colors. It was also during this time that the laurel wreath was made less prominent on the Alfa Romeo emblem. 1972: The Pomigliano d’Arco Alfasud plant opened, which led to a notable change in the Alfa Romeo badge. With the removal of the word MILANO and the wavy lines, a crisp and geometric Alfa Romeo symbol was born. 1982: The formal elements and colors were reimagined, as well as the serpent and the composition of the ALFA ROMEO name in the Futura typeface. The golden laurel wreath, which had symbolized Alfa Romeo’s success is the racing world, was removed and the diameter was increased. This was a sharp contrast from the historic 1910 logo, which was indicative of Alfa Romeo’s contemporary positioning in the luxury vehicle market. 2015: The modern-day Alfa Romeo badge exemplifies the company’s history while positioning the company for the future with a union of elegant geometry and proportion. The incorporated elements and colors highlight the superior status of the manufacturer’s personality. Removing the line which once separated the cross of the municipality from the Visconti serpent highlights the modern-day Alfa Romeo while still hinting at the traditional Italian past. The Alfa Romeo badge has changed and prospered along with the brand for more than a century. The most recently re-designed logo has kept the best parts of the company’s Italian heritage while displaying the ability to transform as a globally-recognized luxury vehicle manufacturer. Just like the vehicles it sells, Alfa Romeo takes pride in what the iconic brand stands for and is committed to in terms of every customer, right down the universal symbol used to market its products. The brand is truly second-to-none, and its logo is very much the same.